If you need to go to Court for your West Bloomfield misdemeanor or felony retail fraud case, you need an experienced criminal defense lawyer who will fight on your behalf. No matter if your accusation is from a national retailer or a small local West Bloomfield business we can help you with your case. Get Hilf & Hilf, PLC on your side for immediate action and steps taken toward achieving positive results. Retail fraud criminal defense specialist Daniel Hilf appears before the Judges at the 48th District Court (in Bloomfield Hills), the 6th Circuit Court, and throughout Oakland County on a regular basis aggressively defending all shoplifting charges. Having to go before a District or Circuit Court Judge may seem depressing and overwhelming, but it is important to remember that facing a retail fraud allegation does not make you a bad person. In fact, retail fraud is prosecuted daily by the West Bloomfield City Attorney and the Oakland County Prosecutor's Office, but it is often based only upon one single allegation of attempted retail theft due to a temporary lapse in judgment. However, just because shoplifting accusations are heard daily and frequently at the 48th District Court and elsewhere in Oakland County it does not mean that there are not serious long term consequences or that it will not affect your life in a really bad way. Any conviction for retail fraud can have a life lasting impact, because a shoplifting sentence from a conviction may include any or all of the following outcomes: the loss of your freedom (incarceration); probation with strict supervisory conditions; loss of employment; professional licensing issues (for lawyers, accountants, nurses, stock brokers, and other positions that require State or Federal licensing); loss of educational opportunities; steep fines and costs; immigration complications (for persons that are not United States citizens); and personal embarrassment. The bottom line is - you need experienced and respected defense help from a highly rated attorney who is one hundred percent on your side. First Degree Retail Fraud is a felony charge that carries up to a 5 year maximum prison sentence (the Judge, however, can choose to impose a probationary sentence instead of imposing incarceration) that is prosecuted when the merchandise involved is $1,000 (one thousand dollars) or more, or if the merchandise involved is $200 (two hundred dollars) or more and the person has a prior theft conviction. Organized Retail Theft is felony charge that carries up to a 5 year maximum prison sentence (the Judge, however, can choose to impose a probationary sentence instead of imposing incarceration) that is also subject to applicable habitual offender sentencing provisions. The offense is alleged to occur when the intent of the Defendant is to commit retail fraud from one or more stores and then resell the stolen merchandise to others. Second Degree Retail Fraud is a misdemeanor charge that carries up to a 1 year maximum county jail sentence (the Judge, however, can choose to impose a probationary sentence instead of imposing incarceration), that is prosecuted when the merchandise involved is at least $200 (two hundred dollars) but less than $1000 (one thousand dollars), or if the merchandise involved is under $200 (two hundred dollars) and the person has a prior theft conviction. Third Degree Retail Fraud is a misdemeanor charge that carries up to a 93 day maximum county jail sentence (the Judge, however, can choose to impose a probationary sentence instead of imposing incarceration), that is prosecuted under either State law or local ordinance, when the merchandise involved in the offense is less than $200 (two hundred dollars). Removal of a Theft Detection Device is a misdemeanor charges that carries up to a 1 year maximum county jail sentence (the Judge, however, can choose to impose a probationary sentence instead of imposing incarceration), that is prosecuted under State law. Many businesses in West Bloomfield and Oakland County have developed well thought out, comprehensive loss prevention policies with the goal of reducing retail fraud losses and insurance costs, avoiding contested litigation, and deterring overall store theft. It is now common for a coordinated team of loss prevention personnel and high-tech shoplifting prevention equipment (such as merchandise sensors and closed circuit television) to be found within a store for the purpose of combating the liabilities and costs associated with retail fraud. Even with this advanced technology and training, mistakes are still made and persons are still sometimes falsely arrested due to errors in judgment (such as false identification and false interpretation of a situation), cultural issues, and procedural errors. 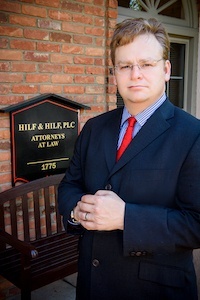 If you choose to hire attorney Daniel Hilf for your retail fraud case case, he will obtain all the available discovery materials to fully and properly defend you, which can include the following: police report(s), loss prevention report(s), witness statement(s), in store video(s), police video(s), photograph(s), statement(s) the police and/or loss prevention claims that you made. Attorney Daniel Hilf will provide you with strong and solid advice concerning whether to conduct a trial in front of a Judge or jury, or whether to choose to accept a plea or plea bargain and try and persuade the Judge to be lenient with you. It is ultimately up to you to decide if you want to seek a plea bargain (an agreement with the prosecution to dismiss or reduce the charge(s) against you) or seek a favorable sentence agreement (an agreement with the Judge and/or prosecutor to impose a specific sentence, such as avoiding or limiting any term of confinement) or proceed to trial to fight for acquittal. A major decision for you which you should not delay is to hire aggressive retail fraud defense representation to help you obtain the best possible result for your circumstances. A retail fraud conviction will likely cause you a whole host of everyday problems in addition to criminal penalties, including making it extremely hard to find a job or career, because many companies do not want to risk hiring someone convicted of theft. Hire a leading retail criminal defense lawyer for your West Bloomfield based allegation - attorney Daniel Hilf - to help you. Attorney Hilf is widely respected throughout Oakland County, due to his over twenty years of experience inside and outside of Michigan courtrooms, and his legal acumen to help individuals like yourself fight for favorable results. If you have Court due to an alleged West Bloomfield shoplifting incident, now is the time to make an impactful and smart decision concerning your court representation. Contact Hilf & Hilf, PLC for the legal help you need and schedule an appointment.